Juba (Agenzia Fides) - Violence and insecurity continue to proliferate in the African country. A few days ago Egyptian press agency MENA released the news of the murder of two humanitarian operators in the South of Sudan. 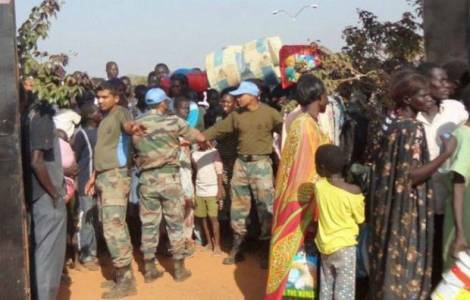 One of the operators who belonged to the United Nations Industrial Development Organization (UNIDO), was killed near the city of Leer, and the other of the organization Hope Restoration was killed near the city of Bentiu. "Over the weekend, gunmen fired against an NGO that was transporting five humanitarian operators along the Nhialdlu-Bentiu road", reads a note of the Catholic Bishops of East African nations (AMECEA) sent to Fides. Following these tragic episodes, Alain Noudehou, humanitarian coordinator of the area, urged the parties in conflict to allow the safe delivery of humanitarian aid. Noudehou has turned to the government and opposition groups to ask for guarantees on the safety of aid operations carried out by operators. The coordinator highlighted the dangers that humanitarian operators face in giving help every day and has called for those who perpetuate atrocious acts to be brought to justice. Noudehou also urged the immediate and unconditional release of seven humanitarian operators kidnapped by an armed group as they were travelling from Kupera to the Counties of Lainya to deliver supplies to health centers. The invitation that the humanitarian coordinator addresses to the parties in conflict is to allow free, safe and unhindered access to reach millions of South Sudanese in difficulty.